Backyards are the perfect place to really let your creativity flow. While you may keep your home’s interior relatively tame, you can bring in lots of bright colors and interesting shapes to your outdoor entertaining space. 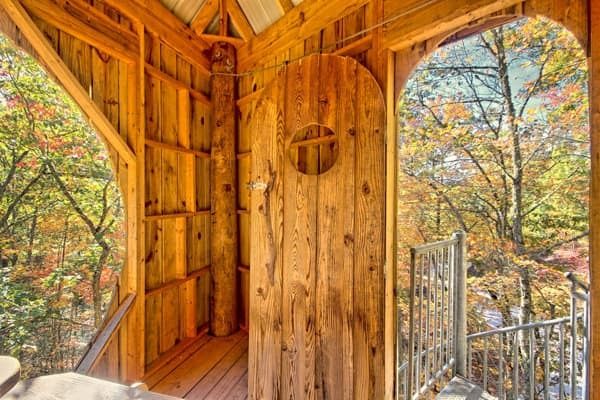 Tree houses are truly a creative outlet for homeowners. They have so much versatility and can be designed to fit your desired function. It can act as a whimsical getaway for kids or as a man cave in your backyard. Just like any deck design, you want to be sure that your tree house is safe for regular use. Here are a few tips to ensure the safety of you and your guests when designing your treehouse! Any experienced DIY-er will tell you that a good plan is the perfect way to avoid extra costs and pitfalls in your design. There are several aspects of your design that you can take care of in the planning stages that will make your final tree house much safer in the long run. A huge part of building a safe tree house is to ensure that you have chosen the right tree as your base. You want a solid tree that can stand up to the extra weight that it will have to hold after you build the tree house. Denser tree will be able to hold more weight and larger treehouses. Once you’ve decided on the right tree for your project, you then have to establish how you want to build around the tree. The base of your platform should be installed at the flattest horizontal point of your tree. You will also need to establish if you want to use any ground supports or bolt all of those beams to the tree. Ground supports are usually used if the treehouse extends too far from the trunk of the tree or if the design spans between two trees. As with most construction projects, you’re going to want to build your tree house to minimize future maintenance and add to the durability of your structure. There are several design elements that you can include to ensure that your tree house is going to be a long lasting structure. Waterproofing your tree house is a huge part of ensuring the longevity of your design. Because your tree house is most likely an all wood design, excess moisture can escalate any natural deterioration that may occur. Keeping your platform dry is one way to make your treehouse last longer. If you’re building a covered structure with a roof, you want to use a design that not only protects the structure from rain, but also allows water to quickly run off the sides. This avoids any pooling or standing water anywhere on your treehouse. Overhangs play a large role in keeping your treehouse dry. For any outdoor construction project, your material choice will help to make your tree house as safe as possible. You want materials that will stand up to heavy foot traffic and harsh weather conditions. These materials all apply to your tree house design’s actual structure, as well as the different aesthetic choices. The first material you can use to ensure the structural integrity of your tree house is to use galvanized steel when securing your tree house. Galvanized steel is a weatherproof material that is known for its durability. It won’t rust meaning that it won’t compromise the safety or stability of your treehouse. The same principles can be applied to your tree house stairs and railings. For the treehouse itself, there’s something to be said about the rustic look of an all wood design. If you’re building a treehouse from the beginning, regular pressure treated lumber is perfect for the frame. You can find it at any home improvement store and can be used to build your treehouse, much like a deck. The actual floor of your deck isn’t limited to your standard lumber choices. Composite decking materials have seen a surge in popularity recently because of the cost effectiveness. It lasts in harsh weather conditions and under heavy foot traffic with minimal upkeep necessary. This also means there’s a lack of restoration needed to keep the structural integrity of your treehouse intact. Composite decking materials come in a wide range of colors that mimic the natural look of wood. Some tree house designs decide to incorporate small decks or porches to maximize their space. When you’re building a treehouse, you want to ensure that people can safely walk around the space without a falling hazard. This means installing a treehouse railing around the edge of your outdoor spaces. You have several options when it comes to your tree house railing. Much like decorative deck railings, the railing in your tree house design can act as the outdoor walls and help define your space. Railings have flexibility in both design aesthetics and materials used. Don’t feel like you’re limited to the standard all wood railing that can be found on any deck or treehouse. There are so many design options that range from traditional lattice panels to decorative sunburst designs. One tree house railing option that will create a cohesive design is to match your railing to your treehouse stairs. By extending the same design through your staircase to the entire treehouse, you’re creating a beautiful space that far surpasses the old run down wooden platforms that some homeowners may think of. A safe and stable way to access your tree house will definitely add to your tree house’s safety. By adding new tree house stairs to your design, you can more easily access the space. By choosing stairs that can stand up to heavy foot traffic and harsh weather conditions, you can use the space more and more. Many people picture an old rickety wooden ladders when they think of how to access their treehouse. However, you can bypass the danger and instead have an actual staircase leading up to your tree house. A traditional deck stair is a common design for tree houses. Their all wood aesthetics adds to the rustic charm of a backyard treehouse. For an updated and safer way to access your treehouse, consider a spiral stair. While many people may picture spiral stairs in your home, rather than leading up to a room in a tree, it’s the perfect way to reach your tree house. Between the industrial Galvanized Steel and the modern Aluminum Powder Coated spiral stairs, there is a durable and maintenance free option for your tree house stair. If you have an existing treehouse in your backyard, you can add safety by going through a restoration process for your wooden structure. This restoration process can help you ensure the structural integrity of your treehouse, making it safer for anyone using it. The most important part of any restoration process is going to be replacing any damaged or rotting boards. These boards are liabilities when it comes to the safety of your treehouse. If you used lumber for your treehouse platform, you can simply remove a small damaged part and fill in with another piece of wood. Your treehouse restoration may also require the addition of extra supports. Because the tree is living, you may need to install additional supports as the tree changes. If this is the case, find where they are most needed at the base of your structure and secure them to both the tree and the tree house.